I think I might have told my parents I wouldn't post the following pictures. Haha, oops and sorry! I wanted to test the Contax and the Portra 400 on their portrait-taking prowess, so I made them sit for me without giving them any time to prepare. To take any potential unwanted attention off them, I'm including this horrifically embarrassing picture of me getting this shot. Why I didn't think to just step back and lean forward is beyond me. Thank god the picture isn't quite big enough for you to see the most intensely scrunched up face - I didn't even know my face muscles were capable of making such a hideous look. Cringe-worthy! :P I had to include this normal shot for good measure. Also you can see the eerie resemblance between my dad's chin and mine. And to quickly answer a reader question, the polaroid back for the Contax is this accessory that turns the camera into a polaroid... kinda. You switch out the regular film back for the polaroid back and voila, instant prints! The sad part is you waste a good chunk of the polaroid print - the image only fills up a tiny corner (you can see an example here) - but it's fun nonetheless and at least these polaroid films (Fuji FP100) are still in production. Happy hump day and goodnight. i'm sure they don't mind! 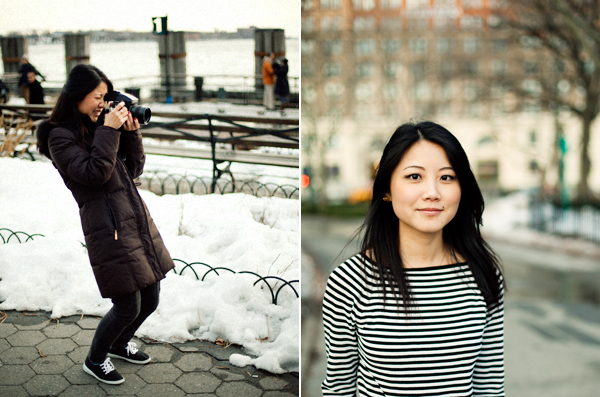 :) who wouldn't love to get their portrait with a Contax? lovely girl :) and great portraits, the portra 400 really does a great job with skin tones! beautiful, all three of you! I think the Contax with the 80mm f/2 is so perfect for portraits. I have quite a few that are I absolutely love, but can't post yet, cuz they're client photos. Soon, I can post. Haha. You're parents are so cute and I think you favor your father, but I still see your mom in you too. Thanks so much for the explanation - You've definitely peaked my interest in the contax! And I see both of your parents reflected in you! Oh yes, you are such a perfect combo of your parents! You've got your mother's lovely face and definitely your father's face-shape. If that makes sense. Fantastic photos! Great photos of your parents! They both look so cute! And you too!